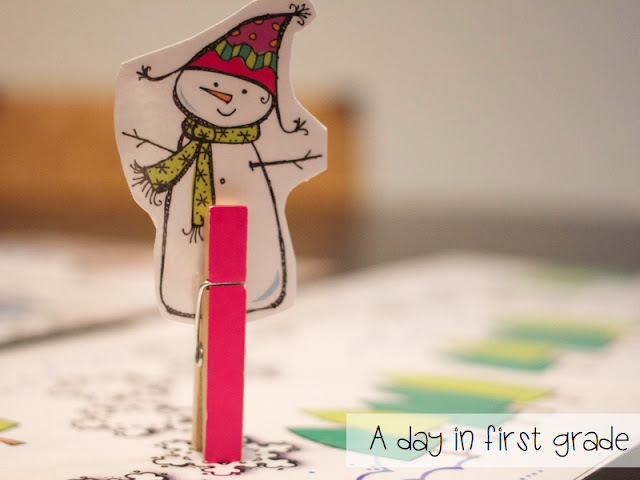 A Day in First Grade | Getting ready for a new year! Happy New Year!! I hope that you are all doing well and are still enjoying your last few days off. I have been thinking about what I am going to teach once we get back to school and am SUPER excited. 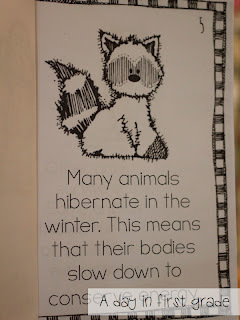 I love January- April in first grade. I always feel like super teacher! Hahaha, you know what I mean though, in these months students start truly applying their knowledge and their learning skyrockets! It’s so fun to see the lightbulbs go off and to challenge our students more and more! However, before the rocket launches, I always have to remind myself that the students have been out of school for nearly two weeks and they need some refreshers. 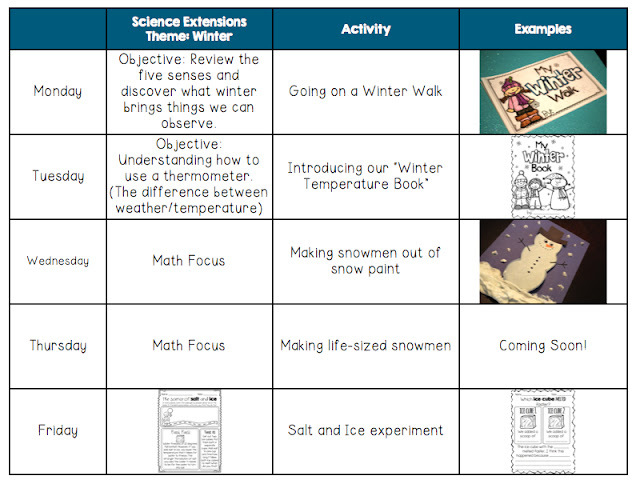 In order to do this, I am going to use the theme of “winter” to entice my students. 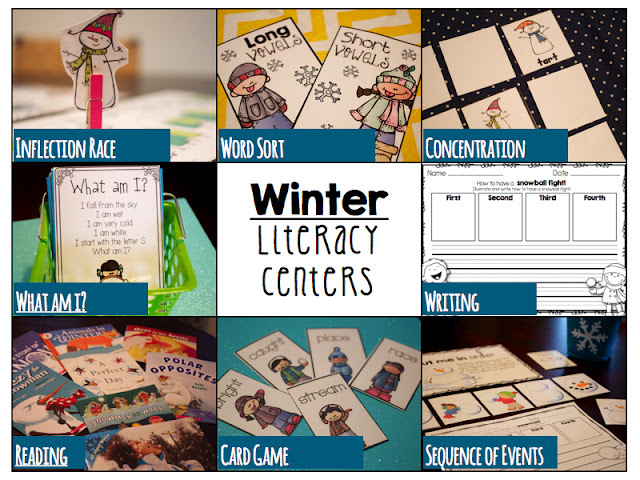 We will play some really fun center games and read a few books that I am sure my students will love. 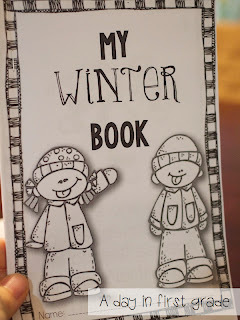 I wrote a winter mini book that I will be using in some of my guided reading groups. My students love these mini readers and learn so much from them! They are also a great way to challenge my students with vocabulary and work on reading strategies. 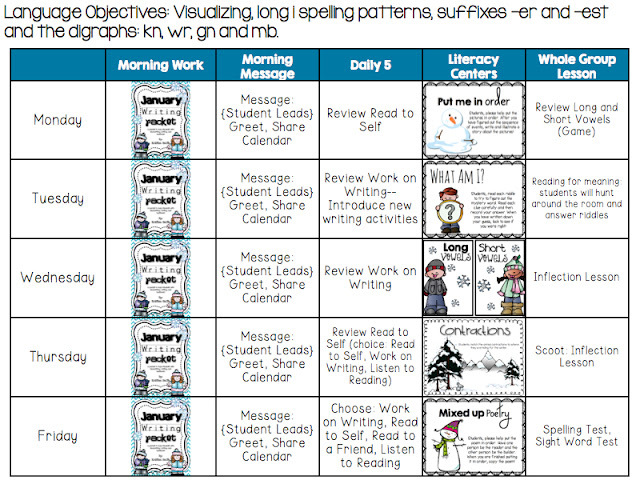 Our centers this week are designed to have my students practice the skills that we were working on right before break. In the first center, they will work on sorting long and short vowel words. I will play this game ‘whole group’ as a “refresher course” on Monday and then put it in my center rotations. The second skill they will work on is a sequence of events center. I LOVE this one! 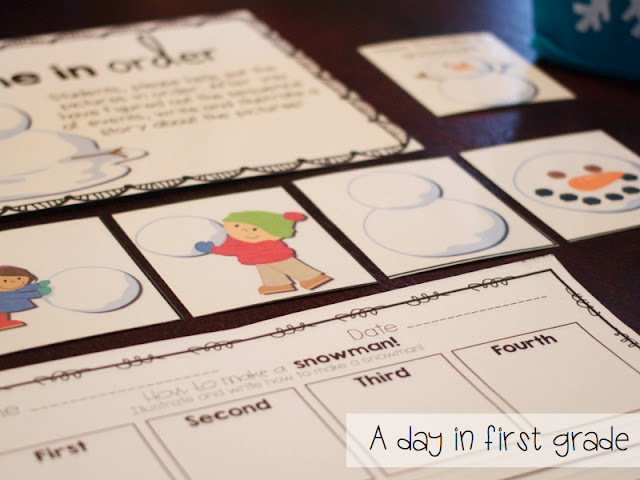 My students will use the picture cards in order to make a snowman (and how to have a snowball fight) and then write a “how to” writing piece. I KNOW they will love this! Third, my students will be so excited that I am bringing back one of their favorite games. 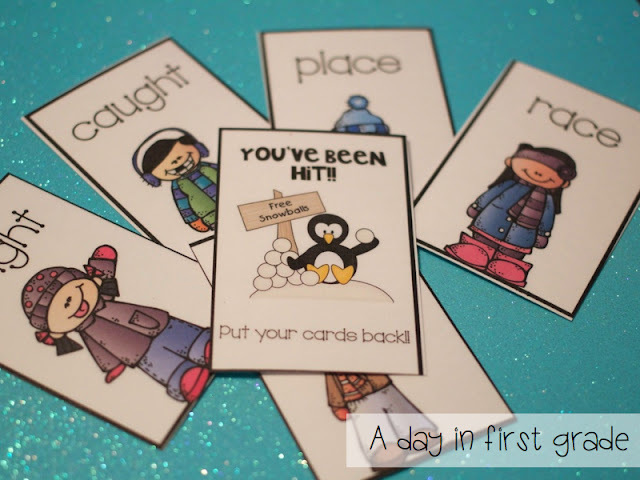 This is a game that requires students to read a variety of leveled cards in a super fun way. I use this game to my advantage and throw in the blends and digraphs that we are working on. To play, I placed all the cards in a cute cup from Target. They pass the cup around the circle collecting one card at a time. However!! They have to look out because there is a sneaky penguin who is ready to hit them with a SNOWBALL! If they pull any of the penguin cards, they have to put all their cards back into the cup and pass the cup to the next friend. They love this game and as you can see, they are working on reading words with tricky digraphs and diphthongs! 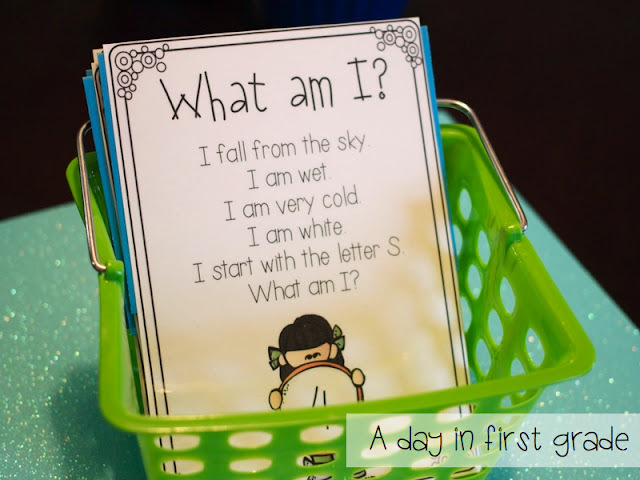 Next, my students will work on their reading and critical thinking skills in my “What am I?” riddle game. In this center, my students will read the clues and then try to infer what the answer is. After they record their inference, they can peak in the envelope. On the back of each card, I used double sided sticky tape to attach an envelope and put the answers into them! 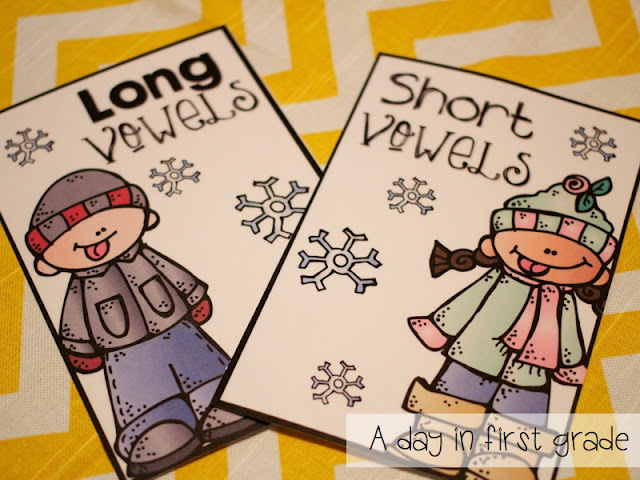 My students will also match contractions and put poems together this week at their centers. 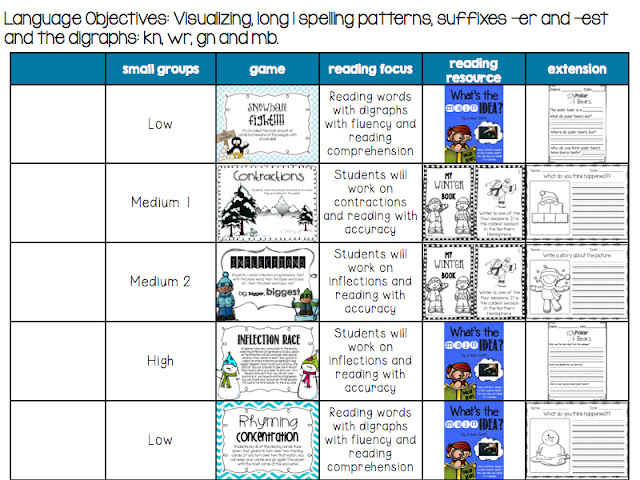 Here is a closer look at my lesson plans! The BIG concept this week is inflections and base words. I have found that some groups get this right away and others take a little bit longer. I will work with my students using a game called “the inflection race” to help them master this concept. 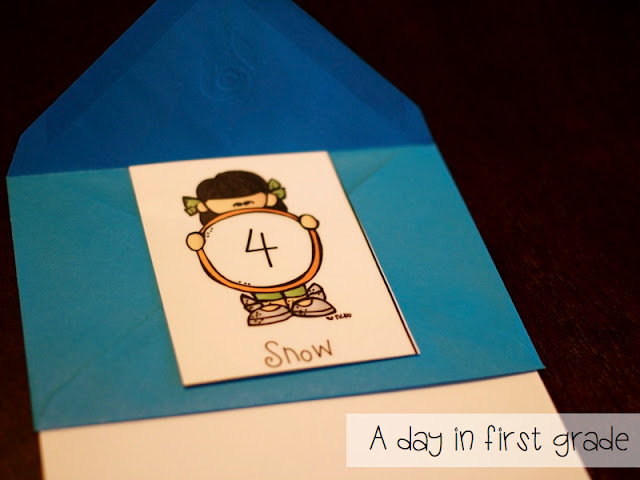 For this game, I will set out mini reminder cards on our guided reading table and teach a mini lesson using them. These cards will also serve as a visual reminder for my students as we play our game. 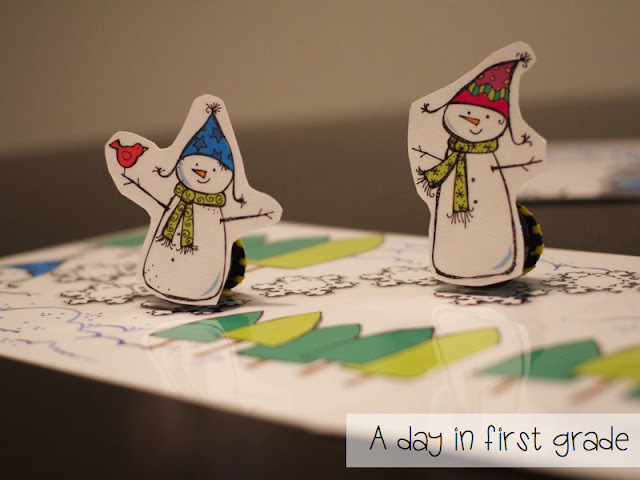 Next, I will give each student a snowman game piece and introduce the playing cards. They will then try to make matches of inflection progressions: cold, colder, coldest. 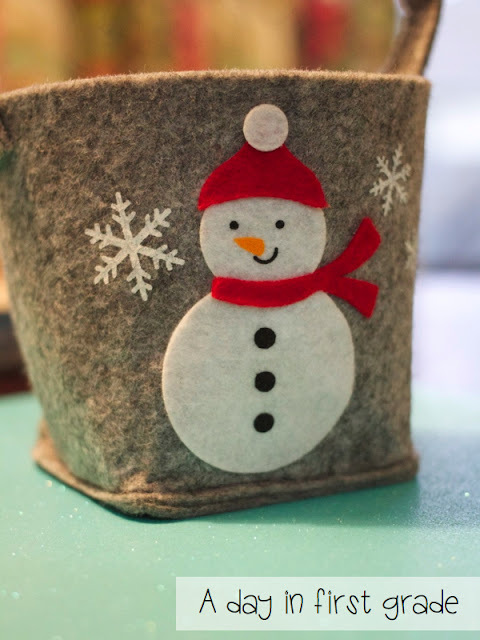 For each match they get, they will be able to move their snowman on the game board. Whoever gets to the end first, wins! 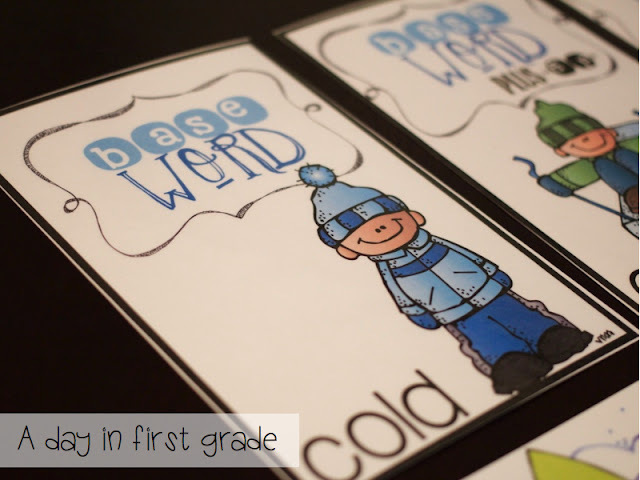 However, they all will be practicing reading and understanding inflections and base words! 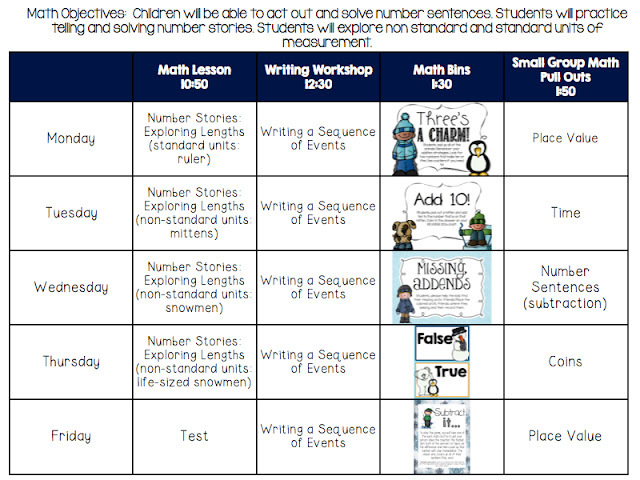 I will blog more in-depthly about our math centers in another blog post, but here is what my lesson plans look like! As for the Science tie-in, here is what my afternoons will look like. 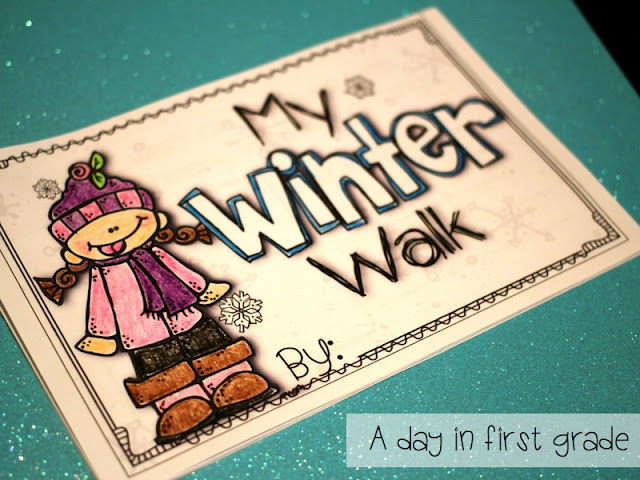 On Monday, after filling out an anchor chart about “winter,” each of my students will be handed a “winter walk” book and we will go explore nature outside. 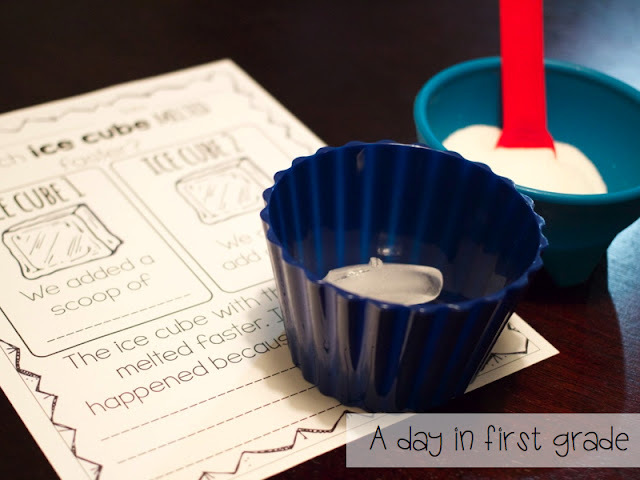 My students will record what they see, hear, smell, touch, notice, and taste? (maybe not!) on our hike! 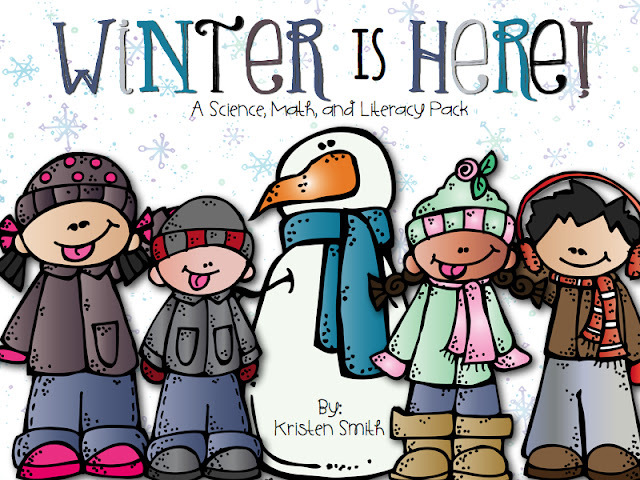 Finally, on Friday we will conduct our first “winter” science experiment. 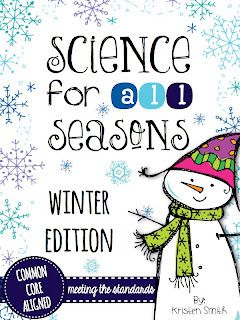 In this experiment my students will explore freezing temperatures and what salt does to ice! 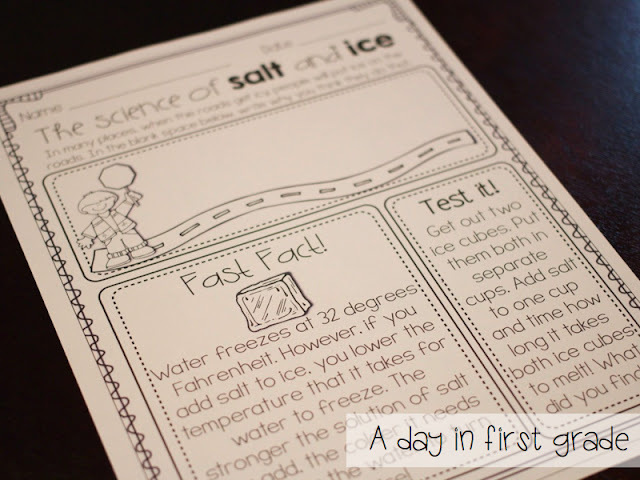 They will read all about it using this page and then try the experiment on it and fill out a recording sheet! 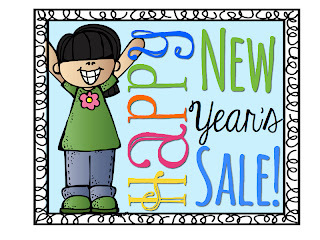 As a way to celebrate New Year’s, I’m throwing a sale at my store. All of the products from this post are available at my store and are 20% off! Just click on the button below to get taken to my store! Put out a new kid desk…I am moving in! Love everything Kristen!! It looks amazing!! Everything looks amazing! I do have a question for you though…. 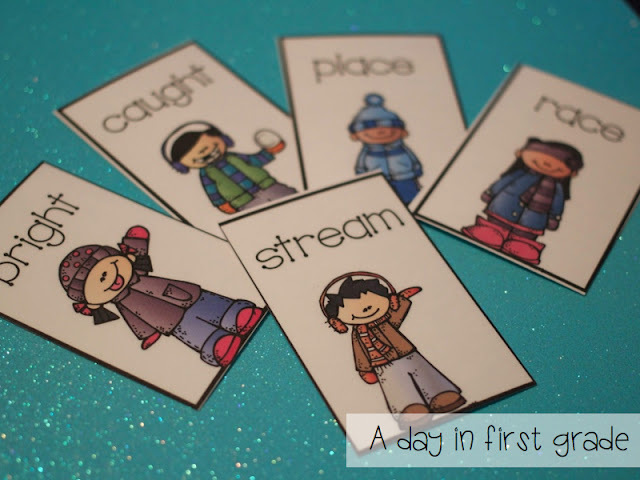 do you do daily 5 and literacy centers? Or what do you do during your reading block?